Don't be the last to know this. According to recent research, the number one reason that people leave an organization is due to conflicts or disappointment with their immediate managers. It's time for a positive change. Skillful managers are the key to a career development and planning process at your organization to help attract and retain the very best people. New Century Management has been in the career development business for many years and we can show your managers how to develop their people. We have worked with hundreds of diverse businesses and individuals to help them reach their full potential through innovative career strategies. Our career development programs support a wide range of activities to help your managers develop career goals based on organizational realities. We'll help your employees grow within your business. We can integrate your organizational and personal goals through innovative tools and standardized processes. 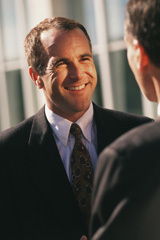 We are leaders in the evolving field of career development. Contact us today so we can help your organization and people grow.